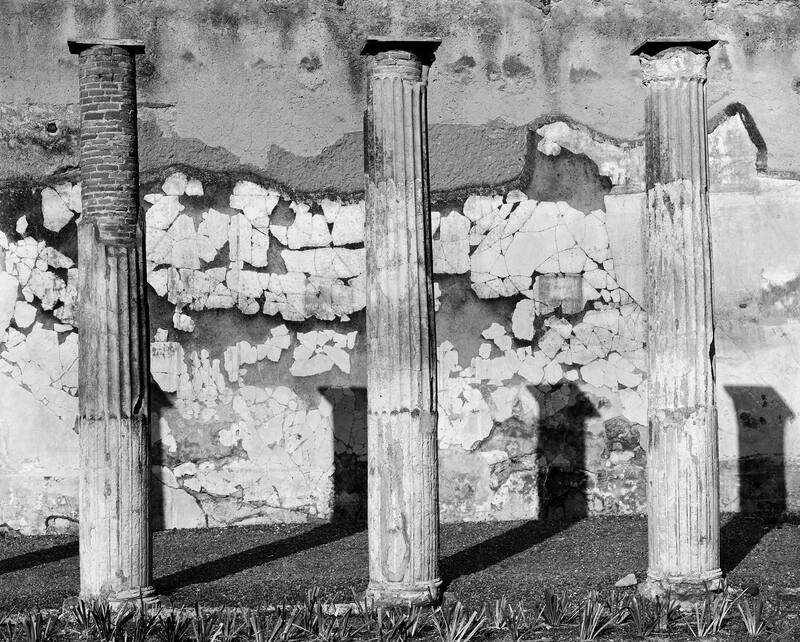 Wylie has photographed Pompeii for five years, capturing haunting, poignant scenes from the ruined Roman city that has remained frozen in time since the catastrophic eruption of Mount Vesuvius in 79 AD. 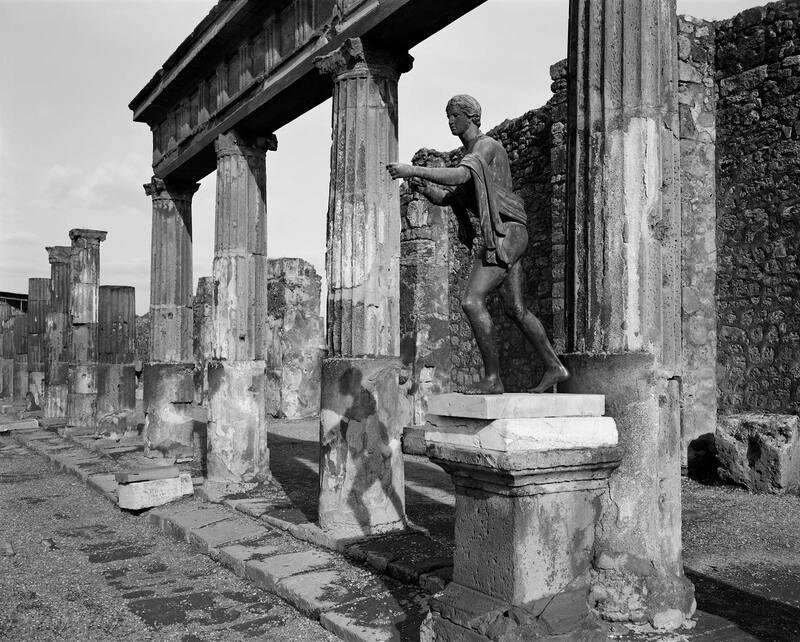 Each time University of Virginia photography professor William Wylie returns to Pompeii, he finds something new to awe, humble or inspire him. For Wylie, a trip to the ill-fated Roman city is a journey through time. It reflects not only the catastrophic volcanic eruption in 79 AD that destroyed the Roman city and killed about 2,000 of its inhabitants, but also the archeologists and artists who have slowly pieced the remains of the city together, and the tourists – 2.5 million of them each year – who witness the devastation afresh each day. 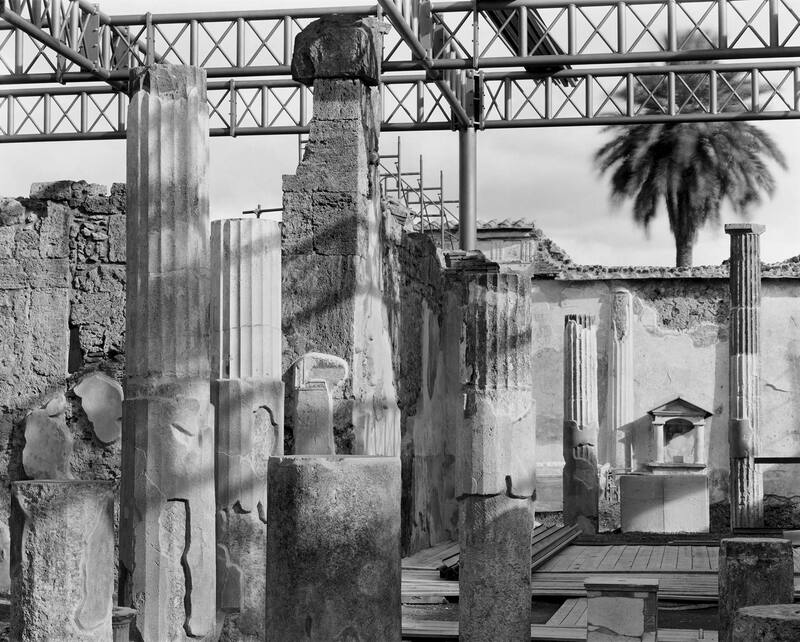 In more than 100 photographs taken over the course of five years, Wylie captures Pompeii’s erstwhile beauty, its breathtaking tragedy and its ongoing history as an archeological site. Eighteen of those photographs are currently on display at the Yale University Art Gallery. A major exhibition of the work recently closed at the Gregory Allicar Museum of Art at Colorado State University and will travel to Vanderbilt University and the Fralin Museum of Art at UVA over the next year. 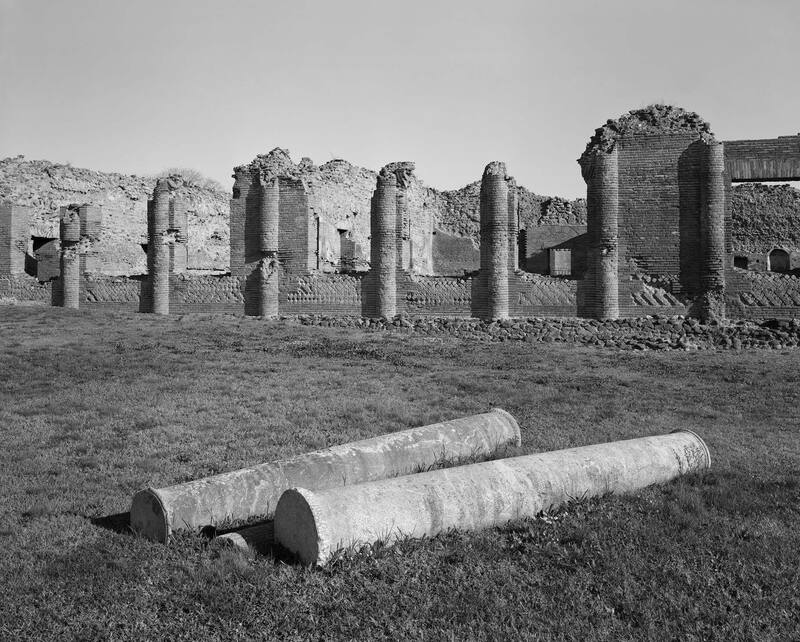 The photographs in that exhibition, along with 50 other images of Pompeii, and are featured in Wylie’s new book, “Pompeii Archive,” recently published by Yale University Press. Below, Wylie shares a few of his favorite images and the stories behind them. 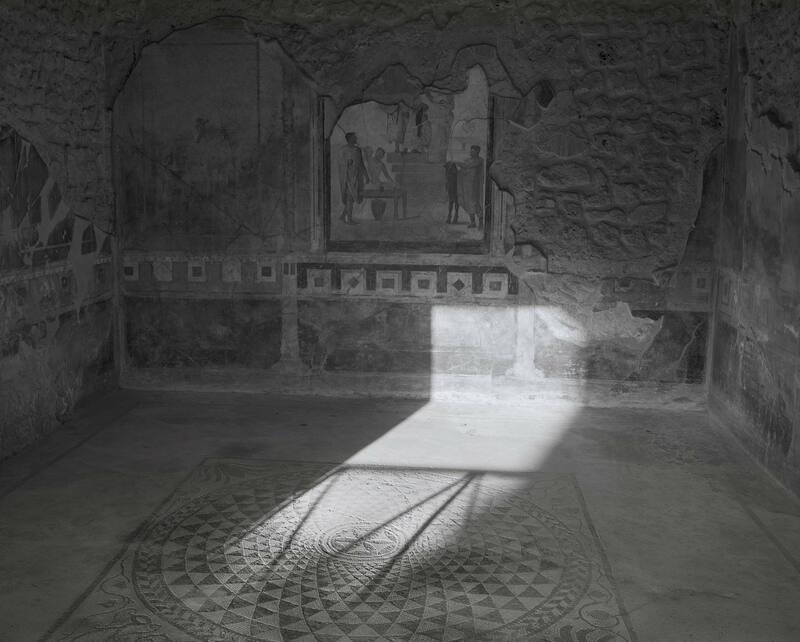 Wylie’s photos are inspired in part by the work of Giorgio Sommer, a mid-19th-century German photographer who documented parts of Pompeii’s excavation. Wylie liked how the photographer created layers in his composition that evoked the layers of history being uncovered on site. 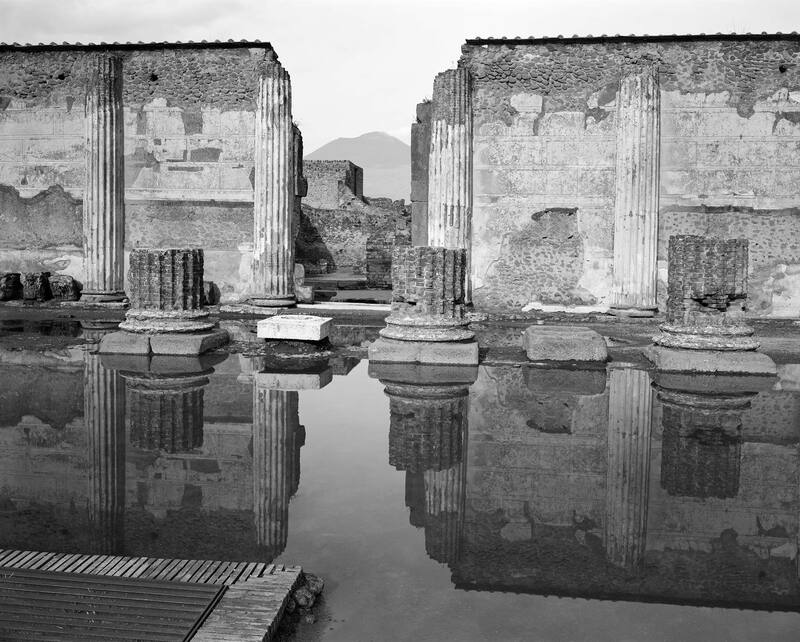 This photo, Wylie said, uses a similar technique with a layered composition showing Mount Vesuvius, Pompeii’s ruined Basilica and the glassy plane of floodwater that invaded the site the day Wylie took the photo. This photo shows a peristyle, which in Greek and Roman architecture typically means an open courtyard surrounded by a columned porch. Wylie said this photo of the Temple of Apollo felt particularly extraordinary because it reflected one of Sommer’s 19th-century compositions while adding a new element – the Apollo statue that was restored in 2009 and returned to its original site. “It’s an old idea, but you still cannot escape the importance of time, or the precise moment, in photography. This photograph has an interesting compression of time involved in its making and its unseen life in the world. “This photograph was made in a race against the dying light of the day. 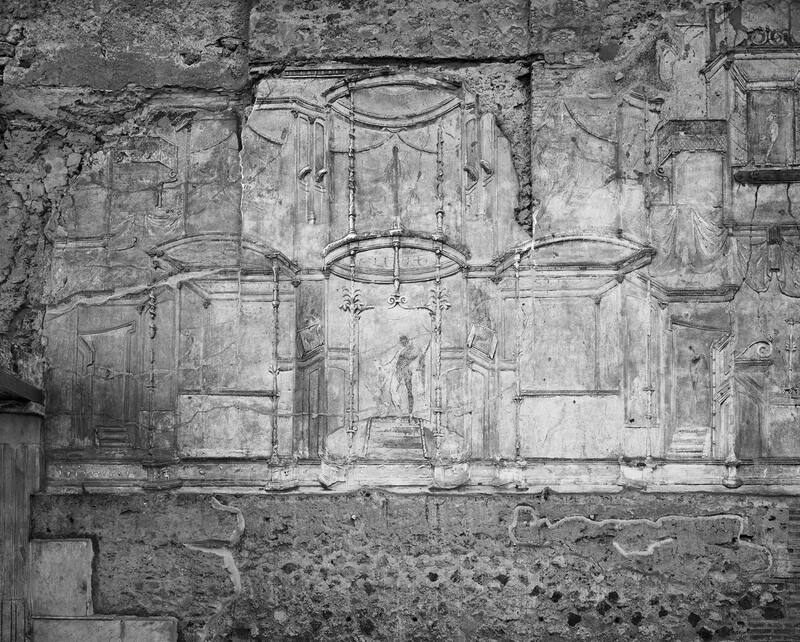 A sense of compression is always present in the walls of Pompeii, and this relief facing the courtyard in the Stabian Baths had deteriorated to a sort of perfection in my mind. All the details are present within a beautiful flux of visibility and invisibility depending on the time of day and the amount of light strafing the wall. Looking back at this photo, Wylie unearthed a comparison that made it feel even more powerful. “These columns are laid out like the fallen soldiers in old Civil War photographs, side by side, opposite end to opposite end. Behind their bodies, their damaged and scarred brick companions form a tattered line. In the photograph, there is a quietude that feels like an aftermath. “None of that was in my mind when I made the exposure. I only recall the perfection of the form and the rolling rhythm of the top of the wall against that clear sky. I also remember the warm winter sun on my back, and my family excitedly talking nearby about some broken pottery fragments. This home was among the more sumptuous in the ancient city, belonging to the Poppei family. It is named for the gold-leaf Cupids depicted among its many frescos. “Sometimes the daily opulence of ancient Pompeii just comes to life. In the right afternoon light, this beautiful mosaic and the rich fresco paintings on the walls of the room create a sense of lived experience that is almost palpable. And this kind of experience is what makes Pompeii such an incredible place. Buried and preserved and then uncovered and revealed, time seems stopped. But another look reveals the cracked edges and crumbling plaster and an unclear transaction between some men and what looks to be a horse. The modern and the ancient intersect in this photo, as Wylie captured both the house itself and the preservation efforts underway. “This photograph makes me think of a movie set with the props and tracks for lights. The last image Wylie chose to share is a poignant reminder of the lives cut short by Mount Vesuvius so many years ago. 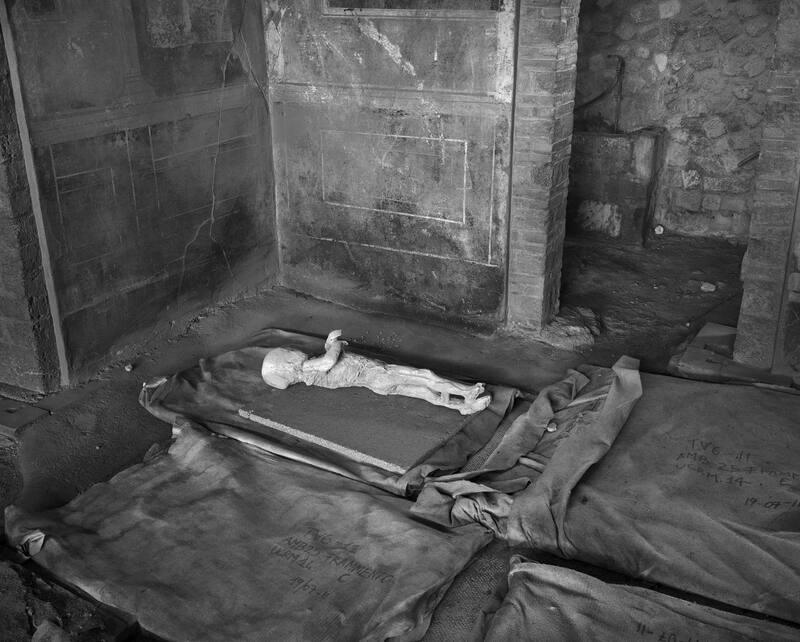 It shows the cast of a child’s body, one member of a family of four that died that day, buried while hiding in their home. Sadly, Wylie said, it’s a scene he can still imagine in war-torn or disaster-ravaged areas of the world today. “This figure, in a position preserved at the moment of death, was made by archaeologists in the 19th century using Giuseppe Fiorelli’s technique of pouring liquid plaster into the hollows left in the ash where bodies had decomposed.